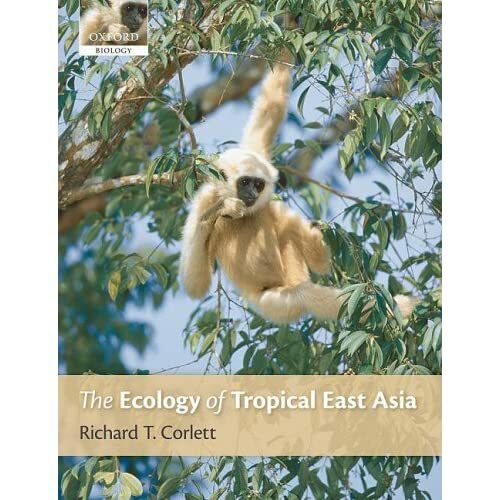 A new book by Richard Corlett of National University of Singapore is the first to describe the terrestrial ecology of the entire East Asian tropics and subtropics, from southern China to western Indonesia. The Ecology of Tropical East Asia explores the elements that foster the region’s richness of plant and animal species as well as the threats facing biodiversity and conservation, including deforestation, hunting, climate change, logging and resource extraction. Corlett concludes that high human population densities, continued population growth, rural poverty, corruption, and globalized markets will present obstacles for conservation but that the chief aim for conservationists should be to safeguard existing protected areas. Mongabay: Why did you decide to write a book about the ecology of tropical East Asia? Aren’t already there field guides covering this part of the world? Richard Corlett: I have had the idea in the back of my mind for years, but I finally decided to do it after having dinner with a group of Thai graduate students in Bangkok four years ago. They knew a great deal about their research sites and quite a lot about Thailand, but very little about the rest of the region and what other people were doing. The region is united by biology but divided by history and language. There have been several books on the tropical rainforests of Malaysia and Indonesia – including Tim Whitmore’s classic ‘Tropical Rain Forests of the Far East’ – but that is only a fraction of the region and only one of its major natural ecosystems. There are also books on some single countries. But there are no real biological boundaries between southern China in the north and western Indonesia in the south, or between the Andamans in the west and the Ryukyus, Philippines and Sulawesi in the east. The western land boundary of the book is the border between Myanmar and India – purely for convenience – but the other boundaries are biological, if not always very sharp. I called it “Tropical East Asia” rather than Southeast Asia, because modern political Southeast Asia excludes tropical China, which is part of the region, and includes eastern Indonesia, which is biologically very different. Coverage extends to 30 degrees north in China and the Ryukyu Islands so that I can cover the tropical-temperate transition. Mongabay: Generally, what is the state of natural ecosystems in the region? Are some on the brink and others in relatively good shape? Richard Corlett: Mostly bad and getting worse. I have been in the region for almost 30 years and almost everywhere has lost forest and species over that period. Most remaining forest has been logged and/or lost its large mammals and birds to hunters. The small number of global extinctions is misleading, since so many species hang on in only a tiny fraction of their natural range. Nowhere in the region has all the species that used to be there. My favorite picture in the book is a bronze ritual vessel in the shape of a Sumatran rhino from Shandong Province, central China, around 3000 years ago. There are no rhinos in China anymore and only a few hundred left in the whole region.